The announcement , made today, confirms that Leamington has not made the shortlist of cities and regions which were bidding to be the home of the television channel's new headquarters or one of two new hubs as part of its relocation plan. Bristol, Cardiff, Glasgow, Greater Manchester, Leeds, Liverpool and a bid from the West Midlands Combined Authority have been shortlisted as possible locations for both the national headquarters or a creative hub. Belfast, Brighton, Newcastle-Gateshead, Nottingham, Sheffield and Stoke-on-Trent have been shortlisted for the hubs only. Commenting about the announcement, on his Facebook page Warwick and Leamington MP Matt Western said: "Extremely disappointed to see that Warwick and Leamington has not been shortlisted for Channel 4's ‘4 All the UK’ project to move their national HQ and creative hubs to the region. 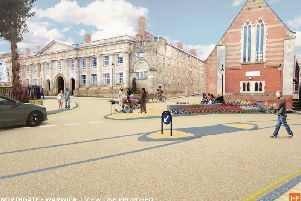 "Warwick District Council submitted a bid and I am most disappointed that it was not successful. "Channel 4 coming to Leamington would have been very beneficial to the local area and I am sure my disappointment will be shared by many residents." The team behind Leamington's bid have sent their congratulations to the West Midlands team who have made the final six for the Call 4 All bid. And they will continue to work together on a number of cultural initiatives including a Creative Quarter in the south of the town. Warwick District Council leader Cllr Andrew Mobbs said: " Although we are disappointed not to be going further, for Leamington to even be in a position to submit a credible and competitive bid against much larger UK cities is testament to the great spirit of innovation and creativity inherent in our town. I would like to congratulate team Leamington for their hard work and dedication in putting this bid together. "We would like to thank Craig Spivey Creative, all the local creative companies and our local universities and colleges for their support with the bid. The remaining locations will now have to submit further details of their plans to Channel 4, with the winner expected to be announced in October.